Ljubljana is a small city, and very soon you might feel like exploring its surroundings. Being in the heart of the country, Ljubljana is in an ideal spot to take day trips from to cities near Ljubljana, as well as to explore the medieval castles, mountains, lakes, vineyards and splendid caves that line the way to the Adriatic Sea. 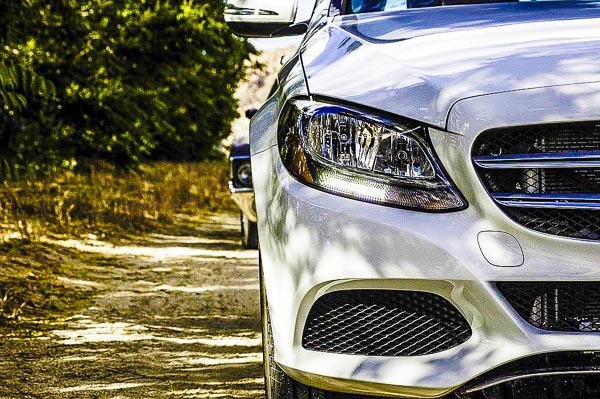 Unless you are coming with your own car to visit, it’s perhaps best to join an organized day tour. Please find some suggestions for day trips below. You do not have to go far out of the city to find interesting and beautiful places. Ljubljana is positioned in the center of the country and within tens of minutes of driving you can already reach hills, parks and towns which are definitely worth seeing. Most of them are easily reachable by public transport, some even by bike. If you have your own car or you rent it, there is no reason why not to hop out of the city center. Click the link hereunder for some suggestions. Slovenia has some 40 km of the Adriatic coastline. 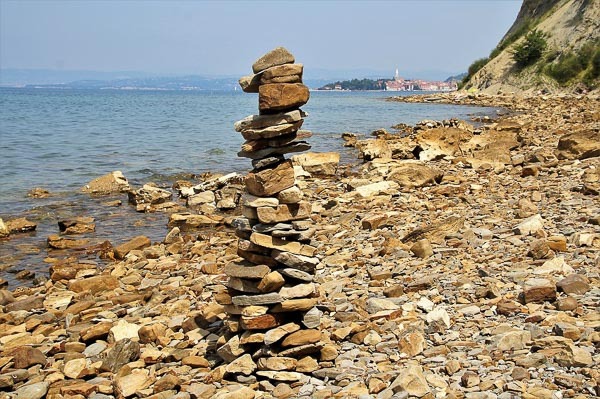 Among the towns of Koper, Izola and Portoroz, Piran is a real gem. Having been a part of Venetian Republic until the end of the 18th century, the Slovenian Adriatic coast still has a bit of Italian population and is truly bilingual. Departing from Ljubljana you can reach the coast in less than 1,5 h drive. 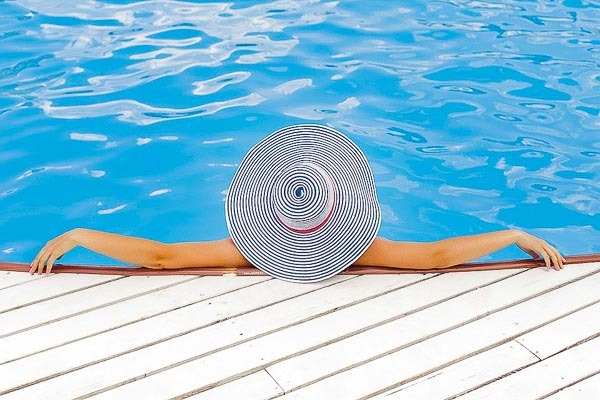 Especially in the summer months hotels and apartments in Slovenian Istria can be quickly full, so make sure you make your booking in advance. The mountain Lake Bled is the most well-known Slovenian lake and also a top tourist destination in the country. The fresh alpine air and clean waters of Bled attract not only day-trippers from Ljubljana but also crowds of holiday-makers in summer, while in the winter the resort offers skiing. 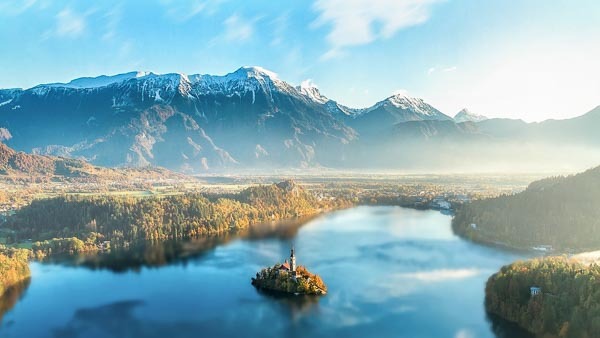 Above the lake, the picturesque Bled Castle stands proudly atop the steep rock and there is an island with a church in the middle of the lake. Visiting the Bled Lake from Ljubljana is easy by taking a bus which runs via Kranj several times a day. If you buy a return ticket, bear in mind that the last bus back to Ljubljana leaves at about 20.30, otherwise you may have to search for Lake Bled accommodation. Bled bus station is located right by the lake. Taking a train is more comfortable and cheaper but you may need to change train in Jesenice. Day trips from Ljubljana to Bled are also offered by many tour operators. To find out more about Lake Bled weather, follow this link. The biggest lake in Slovenia has unfairly been overlooked due to the more popular Lake Bled. It may not boast an island in the middle or a castle above it but it surely offers more tranquillity instead and an abundance of possibilities for outdoor activities like rowing, fishing, canoeing, canyoning and, as it is surrounded by mountains also climbing, paragliding, hiking and skiing in winter. If you don`t have your own car, the best way of getting to Bohinj from Ljubljana and back is to take a bus from the main Ljubljana Bus Station. It runs every hour. 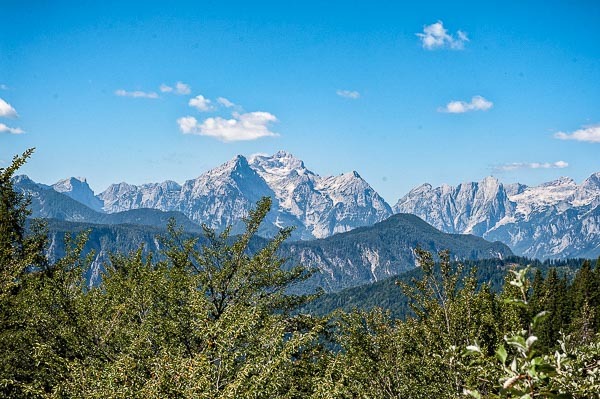 It can be your starting point for the Triglav National Park or climbing Mt. Triglav if you wish. 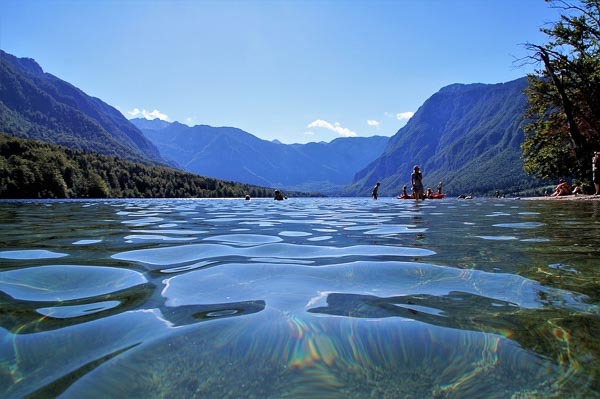 As you may encounter a shortage of accommodation in the high season make sure you find your hotel in Bohinj in advance. To avoid crowds and to contemplate the whole magic of the lake, we recommend a visit out of the high tourist season. Eastern and Southeastern parts of Slovenia are flooded with thermal springs that meet 30-70 degrees C, what makes perfect conditions for health tourism. There are around 15 health resorts, wellness and thermal spas that work throughout the whole year. Some are specialized in medical rehabilitation and treatments but they all offer a vast variety of activities for young and old; from different sports, saunas, massages, summer and winter water parks etc. Please find more about Slovenian thermal spas here. Numerous Slovenian caves give an underground dimension to the geographical diversity of the country. There are around 12.000 caves spreading under the surface, most of them in the SW part of Slovenia. Most are inaccessible without a professional guide and equipment and can also be dangerous to enter. 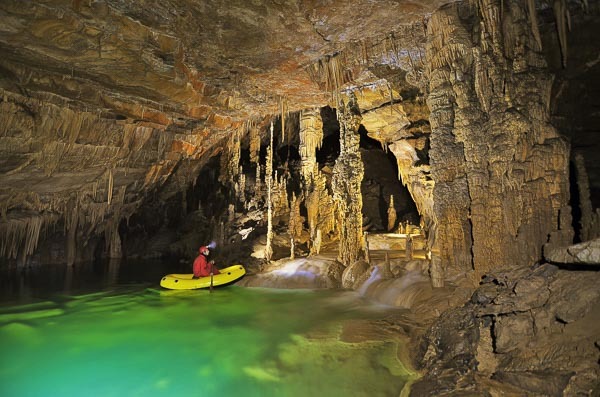 Two most visited are definitely Skocjan and Postojna caves. Triglav National Park is the only national park in Slovenia and is named by Triglav, the highest Slovenian mountain and the symbol of the country. 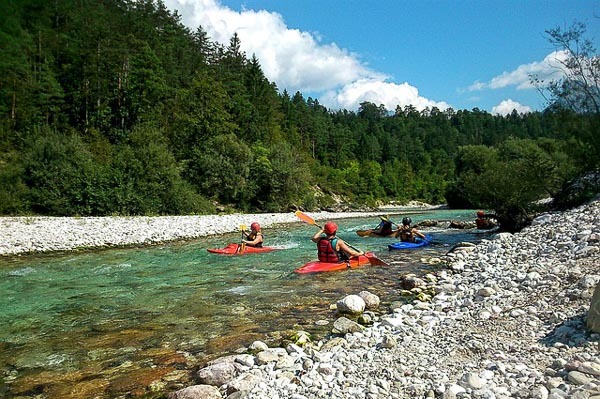 With mountains of the Julian Alps, rivers, lakes, waterfalls and pristine nature the park offers endless possibilities of Alpine cultural and natural experiences throughout the whole year. If you visit the park in the winter time, make sure you are properly equipped. Find your accommodation in hotels and apartments of villages and towns on the edge of the park or in cottages and tourist farms inside it. Should you spend a night in a mountain cottage, make sure you book your bed in advance. Most common villages and towns to find a bed and start your mountain quest are Bohinj, Bled, Kranjska Gora, Mojstrana, Bovec, Kobarid, Tolmin, Most na Soci. The Soca River also named the Emerald River for its distinct emerald green colour, is one of the most beautiful Alpine rivers. It is a haven for the outdoor, the adrenaline and the nature-loving. Its cascades, pools, streams, and waterfalls pose ideal environment for watersports and fishing, while the mountains around it offer opportunities for hiking, climbing, cycling or paragliding. It is hard to believe that about 100 years ago the Soca Valley became an arena of the biggest mountain battles of the World War I and of human existence. If you are a history enthusiast, you will definitely not be bored. Not only fishermen, also foodies like to stop here. There are the famous Soca Trout, cheese tours and Hisa Franko with Ana Ros, the World`s Best Female Chef of 2017. If possible exercise green means of transport or use a summer Hop-on-Hop-Off Shuttle that connects all the main corners of the valley. Sleep facilities are lined all along the river with Bovec, Kobarid and Tolmin being biggest towns with most of the hotels and guesthouses. Lipica is famous for its Lipizzaner Horses that have been bred here since 1580. It is one of the oldest stud farms in the world and the source of all the world Lipizzaner Horses. The farm has its own classical riding school that you can observe performing weekly and even daily in the summer-time. The stud farm tours are popular and take place several times per day in different languages. There are programmes for families and children and also a museum if you want to know more. The natural environment of the farm is truly beautiful and seeing a herd of 100 horses galloping mutually over meadows makes you get goose-bumps. As there is no direct bus connecting Ljubljana and Lipica it is best to join an organized day tour. If you do take a bus, Sezana is a town you have to get to. There is a hotel adjacent to the farm which also runs a golf club with a golf course. For online hotel reservation visit Hotels in Lipica and around it. 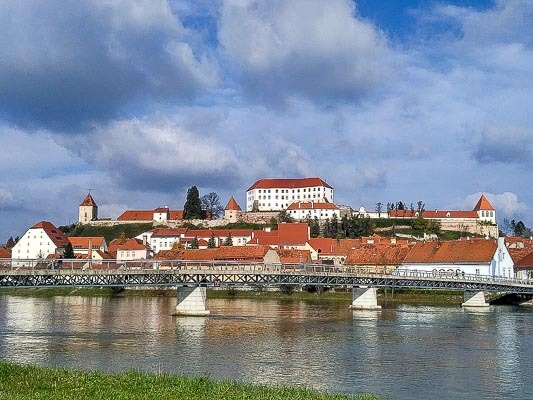 Ptuj is famous for three things: wine, Shrovetide »kurentovanje« carnival and for being the oldest town in Slovenia. As it is relatively small, you can walk it and visit its highlights in less than a day. Walk the picturesque city center and learn about the old Roman and Medieval heritage of the town. There is a castle atop the hill above the city that houses a museum and offers impressive views of the city and wider. 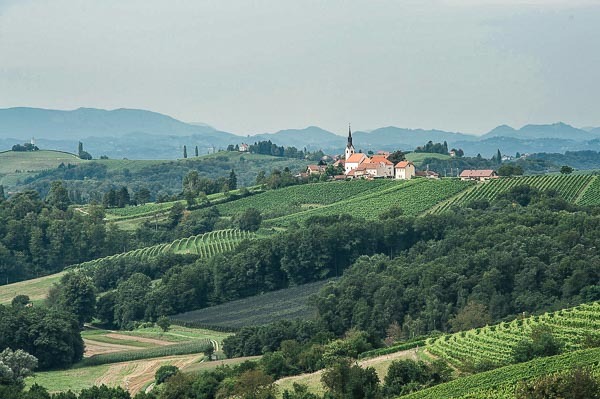 Outer reaches of Ptuj present one of Slovenia`s most popular wine areas with an excellent range of white wines. Take the Wine Road through vineyards of Haloze and Slovenske Gorice or visit underground corridors of Ptuj Wine Cellar, which is the oldest in Slovenia. There are thermal springs with spas in a walking distance of the center of the town. If you decide to visit the famous Shrovetide »kurentovanje« festival« in February, make sure to book your bed soon as capacities are filling up fast for the carnival. 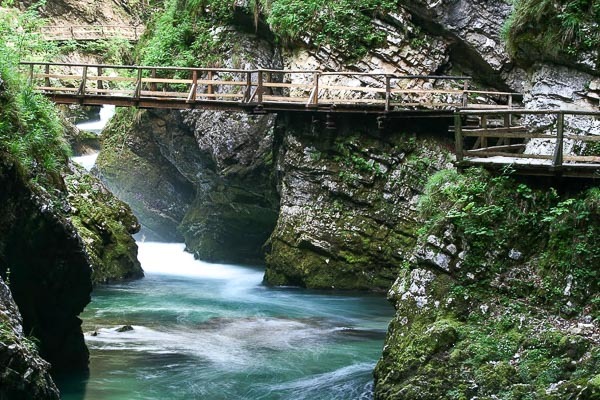 You can find Vintgar Gorge about 4 km NW from Lake Bled if you follow a road towards Gorje and Podhom. The gorge is caught between 100 m high vertical walls of surrounding hills where the Radovna river carved its way through and formed numerous waterfalls, rapids and pools. There is a pleasant and easy trail that leads you along the gorge and is suitable for everyone, elderly and children as well. The gorge is accessible from 8 am until 7 pm and there is an entrance fee of 5 € for adults. No credit card is taken so please have cash prepared. Slovenia is a land of numerous castles and Predjama Castle is one of the most fascinating. Guarding a 123 m high cliff it hides a cave system of tunnels which particularly in the past inspired stories and legends. The one of the brave robber baron Erazem is still living today. To know more about the castle and its history there are audio guides available in 17 languages. 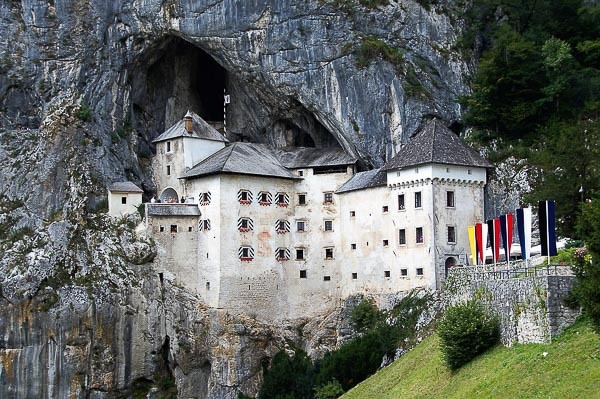 There is a cave under Predjama Castle that is open for visitors from May to September. It has a network of corridors with more than 14 km in length. The castle is about 10 km away from the Postojna Cave. With a combo ticket you can use a free shuttle bus connecting both attractions but runs in July and August only. Predjama Castle is a popular tourist sight so expect crowds especially during the high tourist season. 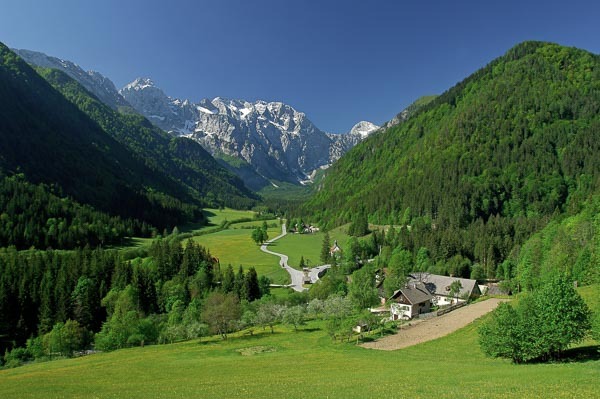 Logarska Dolina is a fascinating Alpine glacier valley, which is definitely worth a stop if you`re a nature person and love outdoor activities. It lies in the region of Solcava, which hides many additional beauties from waterfalls, rivers, hiking, biking, rafting or climbing possibilities, tourist farms and culinary delicacies. One of the main attractions is Solcava Panoramic Road. Part of it is gravel, but it’s perfectly doable with a regular car or a bike. Logar Valley with Solcava is not as crowded with visitors as Bled or Bohinj are. One of the reasons is a lack of any kind of public transportation from Ljubljana. However, there are some regular buses connecting Logarska Valley with the town of Celje. Maybe you should consider renting a car or taking an organised trip. Are there daily tours from Ljubljana conducted? – Yes. 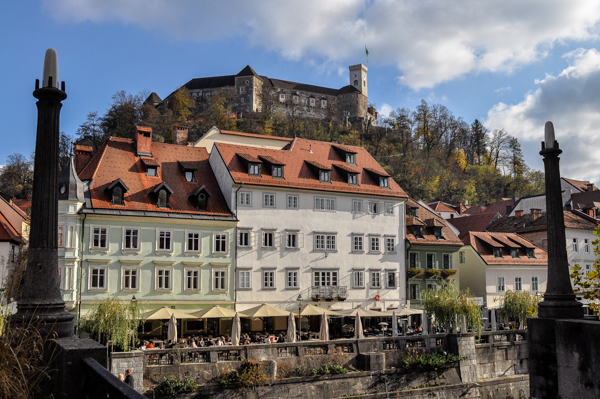 There are agencies that conduct daily tours from Ljubljana to Slovenian tourist destinations. Are Ljubljana tours to Lake Bled conducted too? – Yes.